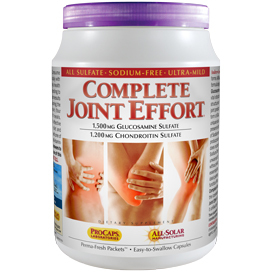 Andrew Lessman's COMPLETE JOINT EFFORT is a Sodium-Free formula providing the optimum potency and the ideal forms (All Sulfate) of the most important ingredients for the maintenance and repair of healthy joint tissue. 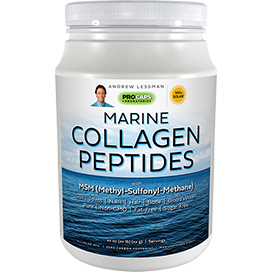 This unique formula begins with the research-recommended levels of the two clinically-established natural ingredients for joint health: Glucosamine Sulfate (1,500 mg) and Chondroitin Sulfate (1,200 mg). These two ingredients are not medicines, but the vital structural molecules that are required for our joints to retain their elasticity and healthy structure as we age. Glucosamine is always the first line of joint defense, but unlike ordinary joint products, we refuse to use unproven Glucosamine HCl (Hydrochloride). 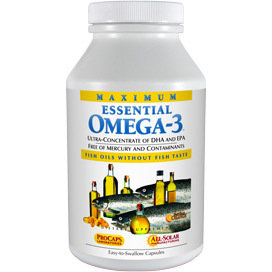 We only use the form of Glucosamine established in thousands of studies - Glucosamine Sulfate. Also unique is our special form of Sodium-Free Chondroitin Sulfate, which eliminates the Sodium present in other joint products. Our special Calcium Chondroitin Sulfate eliminates the risks of Sodium and instead provides the benefits of 80 mg of essential Calcium. 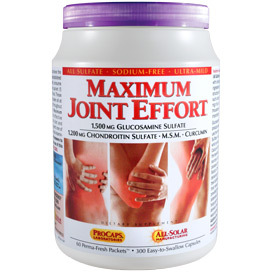 Sadly, typical joint products use inferior sources of both Glucosamine and Chondroitin. 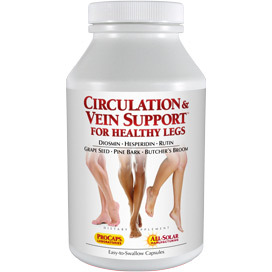 Ordinary Glucosamine HCl does not possess the benefits of the research-established Glucosamine Sulfate while common Sodium Chondroitin Sulfate can adversely affect blood pressure and heart health by delivering unwanted Sodium. Glucosamine and Chondroitin are the "bricks and mortar" of our joints, without which our body cannot create, maintain and repair joint tissue. By providing these two essential structural molecules in their optimum Sulfate form and at their ideal potency, we deliver maximum benefits to joint structure, health and function. No other body part endures more daily abuse than our joints and COMPLETE JOINT EFFORT delivers the proper tools to help combat and repair the consequences of a lifetime of wear and tear. Best of all, COMPLETE JOINT EFFORT is uniquely All Sulfate, Sodium-Free and Additive-Free making it unlike any joint product in the world. Consume one or more capsules daily with food or as directed by a health care professional. According to clinical studies, optimum results are achieved by consuming the contents of one packet (four capsules) daily with meals. This product is most effective as part of a healthy diet and active lifestyle, along with one of Andrew Lessman's multi-vitamin-mineral formulas. 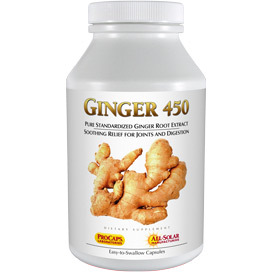 I'm in my late 50's when I started to take this supplement. I walk about 30 minutes every other day and noticed my hips were very stiff and had some pain after about 15 minutes of walking. I was also walking slower. Well after taking this supplement it is GONE!! No more stiffness and no more pain. I actually walk like I'm in my 20's. I have my bounce back. I have been a loyal customer for years and I won't use any other products. Thanks for this one it REALLY WORKS. The joints in my fingers and toes are full or arthritis--to the point doctors wanted to scrape the joints in my big toes 25+ years ago, but I do not want surgery. I have been taking the Complete Joint Effort for around six weeks and can see a BIG difference. My joints are still stiff and swollen, but the pain has decreased significantly. Also, there is an increase in the mobility in my joints as well. I have tried similar products by other manufacturers, but they did not help me. I will never run out of this amazing product and plan to take it forever. Thanks Andrew for making a product that is truly a lifesaver!! I tried all kinds of pain relievers for my back pains. Nothing worked, until I tried Joint Effot Plus. The pain isn't completely gone, but it has helped reduce the pain to a very livable level!